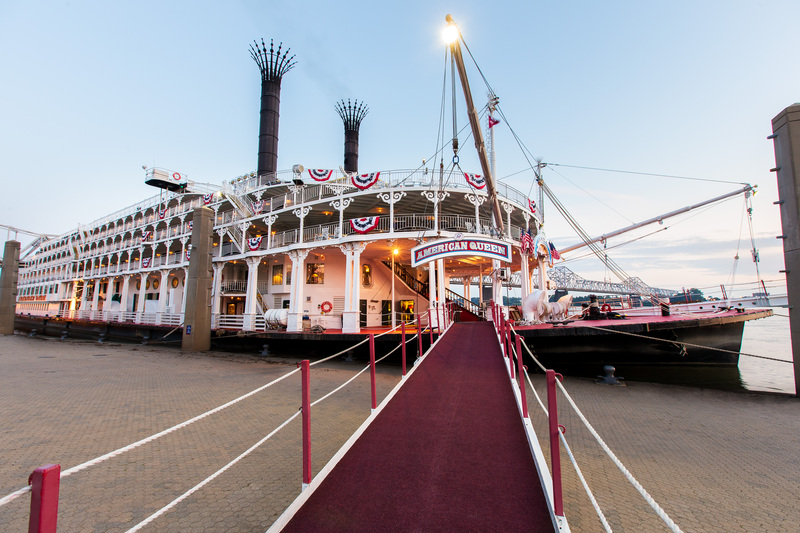 Riverboats have been part of American history since the 19th century, when they carried both cargo and passengers along the country’s great rivers: the Mississippi, Ohio, Missouri, Colorado, Columbia and Sacramento. As depicted in the 1951 movie Showboat, they even brought entertainment and gambling to towns along the Mississippi. As with every “Golden Age”, that of the riverboats came to an end, thanks to competition from the railroads, commercial barges, the rise of the automobile – and finally, WWI and the Great Depression. 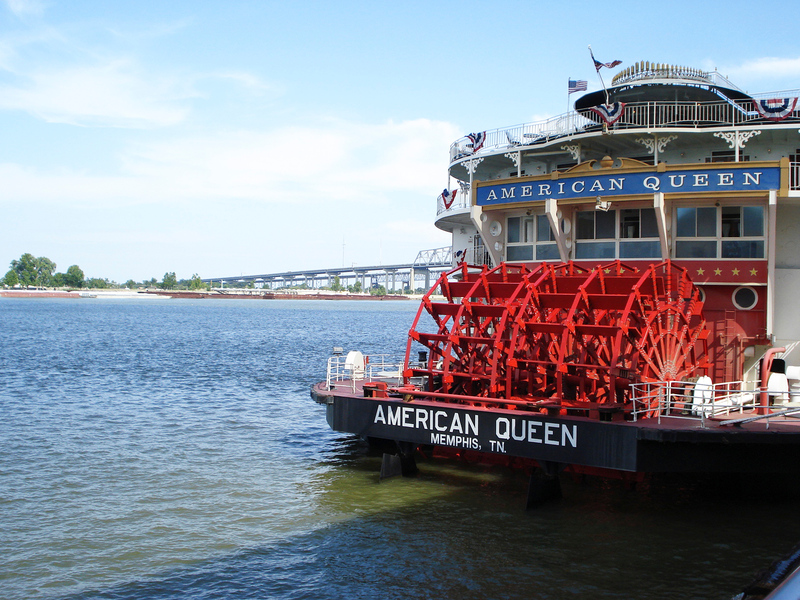 Reviving that great tradition: The American Queen. She was born in 1995, the biggest river steamboat ever built. At 418 feet long and 89 feet wide, she was a six-deck re-creation of a classic Mississippi riverboat with 222 staterooms for a capacity of 436 guests and a crew of 160. 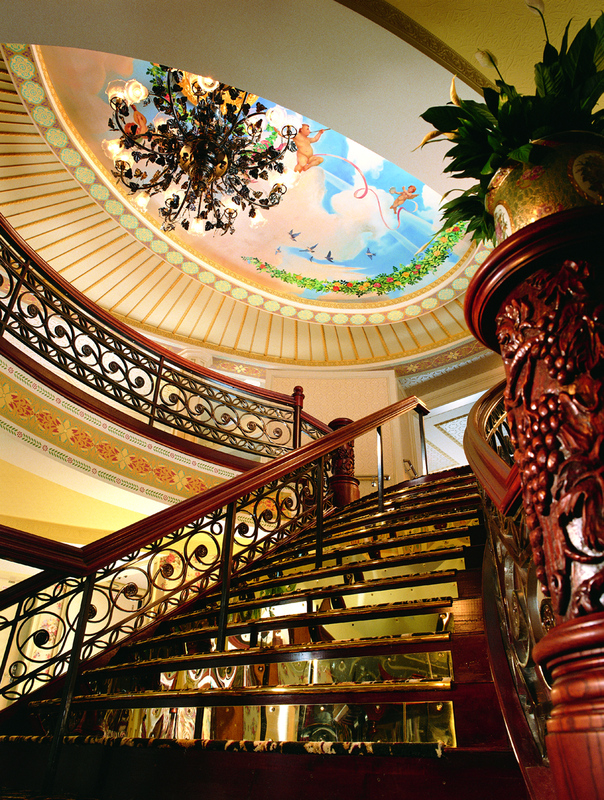 Re-launched in April 2012 after a $6.5 million makeover (and refurbished several times, most recently in time for the 2015 season), the “new” American Queen is a Victorian beauty, her decks graced with white gingerbread trim, her grand staircase illuminated with a sparkling chandelier, upholstery refurbished, dark wood polished, and so on. Cabins have luxury bedding and flat-screen TVs. The River Grill restaurant and bar was created on the upper deck and the Front Porch (buffet venue) and the galley upgraded. Today the American Queen sails eight- to nine-day cruises along the Upper Mississippi, the Lower Mississippi and the Ohio and Tennessee Rivers, with prices starting at $2,799 per person, based on double occupancy. All journeys include a one-night pre-voyage hotel stay, shore tours in all ports, complimentary wine and beer with dinner and other amenities. My American Queen experience was a special holiday cruise that sailed from Memphis to St. Louis, arriving in St. Louis in time for the spectacular Fourth of July celebrations. It began, as all cruises do, with an overnight stay in a luxurious Memphis hotel, which allowed for some relaxation after my flight and some sightseeing, which included a tour of Graceland and a stopover at the Peabody Hotel to watch the Peabody Ducks march to and from the Grand Lobby (a tradition that dates back to 1933). Boarding the American Queen was an impressive experience. She is picture-book lovely, an ane-bellum beauty with the grace and elegance of another time – and very different from the river boats that ply international waters. As I took in the Queen’s classic lines, the sweeping grand staircase, the ceiling mural, the dazzling chandelier, I had a sense of nostalgia that was only enhanced by knowing that I would have modern conveniences along with all the period charm. As a guest of the company, I was fortunate enough to have one of the splendid Promenade Deck suites, which was furnished with Victorian antiques and which had French doors that opened up to the Promenade Deck. 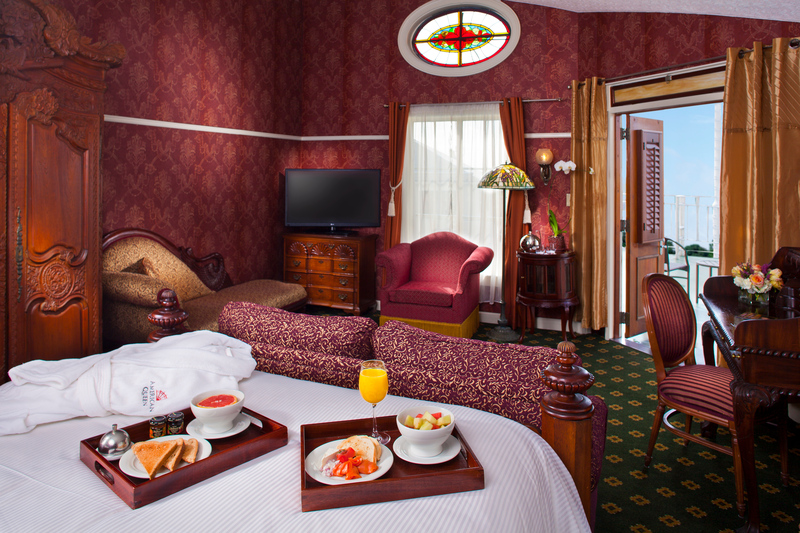 The spaciousness and amenities of the suite were comparable to those found in a boutique hotel. There was so much to like, especially the food, created by celebrated American chef Regina Charboneau. Her movable feast enhanced the sense of place and referenced her southern heritage, with such dishes as melt-in-the-mouth beignets and Bananas Foster French Toast. In addition to breakfast, lunch and dinner in the stately J.M. 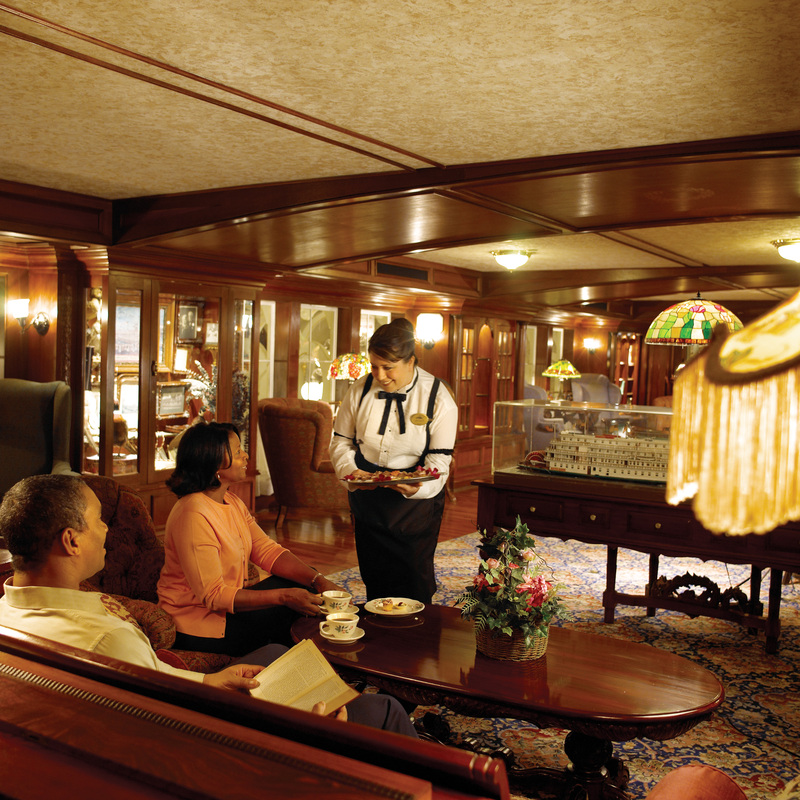 White dining room, there are casual meals, occasional cookouts at the River Grill and a Southern Tea in the Main Deck Lounge. Meals can be prepared for special need/requests: low sodium, Gluten-free, vegetarian Heart Smart, etc. To work off excess calories, the Queen carries bicycles, so in addition to taking the shore tours, conscientious passengers can also explore the river towns on their own. The boat’s gym has Kinesis One equipment, a treadmill, adjustable bench and an exercise bike. My preference was for the Spa by Pevonia, which offers a menu of body treatments, including massages, scrubs and wraps. Entertainment is rich and varied – and appropriate to the itineraries. On every cruise, a resident “riverlorian” tells tales about the towns the Queen visits along the upper and lower Mississippi and the Ohio and Tennessee rivers. In keeping with the Victorian decor, there’s calliope music (passengers have an opportunity to play), as well as sing-alongs. More extravagant entertainment – lavishly produced shows, for example — takes place in the Grand Saloon. On the lighter side, there might be a culinary competition between crew members – a comic contrast to one of Chef Charboneau’s demonstrations (on my cruise she demonstrated how to make melt-in-your-mouth biscuits). When quiet time is desired, the Mark Twain Gallery, the boat’s library, is a fine place to browse the impressive collection of books, check email or just relax. The 2015 season includes a number of theme and holiday cruises, among them a Fourth of July cruise similar to the one I took. It starts in Memphis, stops at New Madrid, Missouri,; Cape Girardeau, Missouri; Chester, Illinois – and finishes in St. Louis, with a spectacular holiday fireworks display. While riverboat prices are higher than for some ocean cruises, keep in mind that they include substantially more than non-inclusive ocean cruises offer. Review of cruise on riverboat American Queen.